Startup Cambrian Innovation has a new approach that seems to be catching on. On Tuesday, the Boston-based startup announced that it will build one of its water-cleaning, and energy-generating, systems for its first winery: Napa Valley’s Rombauer Vineyards. The winery, famous for its chardonnays, will use the tech to treat all of its wine-making wastewater while also generating 30 kilowatts of electricity and heat. Wineries and breweries have long been some of the earliest adopters of new energy and water technologies, as their vast water and energy use can cost them a lot of money. Many wine and beer makers in Northern California are also focused on building brands with environmental leanings. Some of the earliest customers of Tesla’s stationary batteries have been wineries and breweries. While Cambrian Innovation doesn’t quite have the allure of the Tesla brand just yet, its technology is becoming attractive because it’s returning customer investment in as little as two to three years. That’s thanks to the high costs associated with wastewater and energy for breweries and wineries, as well as some state and utility incentives. Since the company has routinely been able to do this -- it has systems installed or under construction in eight locations -- it is now able to offer its technology to its customers as a service, with no money down and a monthly fee, backed by a $30 million fund. Lagunitas is using the service option to build another Cambrian system at a new brewery in Southern California. The same service-based business model innovation unlocked the solar industry years ago. Will it do the same for clean water systems for industry? From the street, the silver tanks and metal pipes at the Lagunitas Brewing Company in Petaluma look like any standard, large brewery. Walking closer, the classic brewery smell of malty warm hops pervades the air. But weave behind the tanks and enter one of the shipping containers marked “EcoVolt” and you’ll see, and smell, something pretty different. Brian Hemphill, Cambrian Innovation’s senior director of operations, leads me into a shipping container that acts as the control room for Lagunitas’ water cleaning system. Originally the technology was developed with a grant from NASA, by co-founders and MIT researchers Matt Silver and Justin Buck, to help create a system for reusing water and reducing energy consumption in an environment in space. “The challenges associated with maintaining life support on a space station are very similar with environmental sustainability on earth,” said Silver in an interview. Cambrian was officially founded in 2006 with funding from various grants, but it wasn’t until 2010 that the technology became more established at a commercial scale and fully envisioned as a product. The company has raised seed and Series A rounds, and is considering a Series B. The Lagunitas site, one of the first for Cambrian, was installed in 2014 and expanded shortly thereafter. 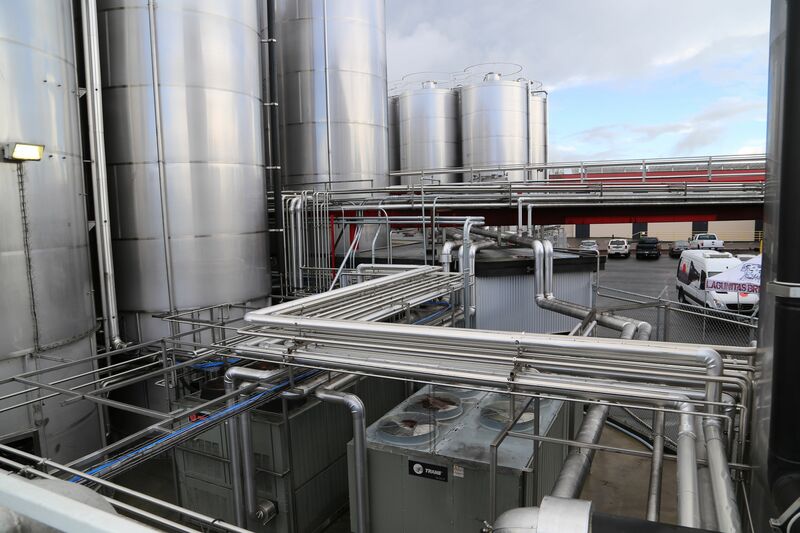 The biogas generated by the EcoVolt’s microbes is piped to two compact turbines that produce 90 kilowatts of energy that is used by the brewery. 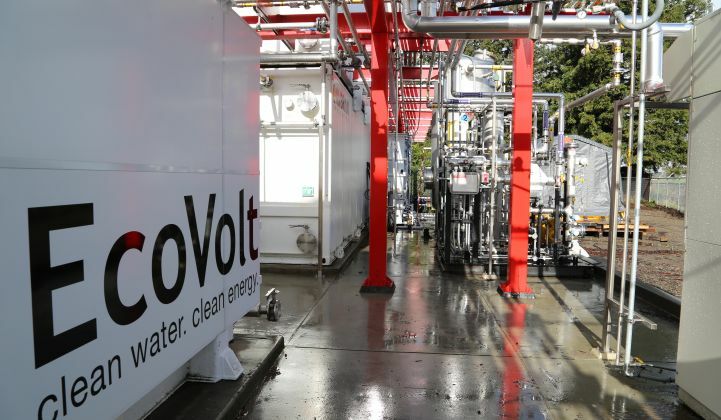 The EcoVolts clean the dirty water, which the industry calls “high-strength” wastewater. It’s commonly created by industrial processes and contains more organic components than typical wastewater generated by a household. But companies like Lagunitas also produce “low-strength” wastewater, which is more similar to the dirty water from a home. At the Lagunitas brewery, that less-dirty waste water is cleaned by standard off-the-shelf tech that Cambrian also installs in its system. There are commonly two types of ways to clean water using microbes -- anaerobic systems that don’t use oxygen and aerobic systems that do use oxygen. Cambrian’s EcoVolt’s are like a next-generation anaerobic digestor. The technology used to clean the low-strength water consists of standard aerobic digestors and occur in large tanks exposed to the air. During a tour of the brewery, we stand on a railing inches above tanks filled with swirling, warm, brown wastewater. Overall, the Lagunitas Brewery in Petaluma is decreasing its water footprint by 40 percent and lowering its transportation costs of its former wastewater considerably. Between 60 percent and 70 percent of the water in the brewing process is being reused. And there’s significantly less wastewater that the city has to deal with. For its brewery to be built in Azusa, Calif., Lagunitas hopes to save $22.5 million in water costs over the life of the plant. It’s the first company to take advantage of Cambrian’s water-as-a-service business model. Financier Generate Capital invested in Cambrian’s $30 million service-model fund (Generate Capital was co-founded by Jigar Shah, who pioneered the solar-as-a-service business model). Cambrian’s Western Regional Manager, John Garn, thinks the service model will take off in a big way. “No one wants to be the first, but everyone wants to be the second,” says Garn. The company plans to eventually expand beyond the beverage industry to other food processing, industrial processes, industrial dyers, and oil and gas.